THE HESLOP HOUSE: TRICK...OR TREAT? Ah, another holiday behind us, three more to really go. good thing they jam them all into about three months, I don't think I could be crazy all year long! :) Actually I like Halloween. Pumpkins, lights, costumes, candy...candy. kids were all cute this year, as always...how could a kid not be cute in a Halloween costume...o.k. i have seen some not so cute costumes, but that doesn't mean the little people inside them aren't cute. Needless to say, my kids were dashing this year. I finally convinced Conner to give up the sully costume from monsters Inc., the same one i have in every Halloween picture for the last five years. He decided he would be an old man. He pulled it off perfectly, even the walk. 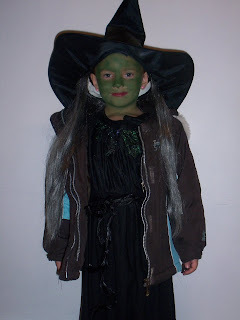 Taylor wanted to be a witch again, but this year she wore the grey hair and I talked her into painting her face green. She is a good little witch. Presley didn't get to choose her costume, last child syndrome...hand-me-downs. 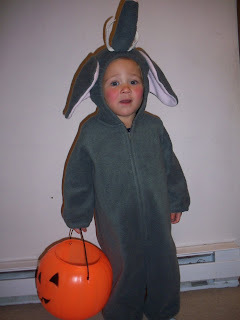 She was an elephant, but I have to say a darn cute one. she loved me putting pink blush on her cheeks...I had to reapply several times just to keep her happy :)She wasn't too sure about the whole trick or treat thing, but she soon joined in after seeing candy was involved and mom was close. In fact she was a little stinker cause after we went to the church party I took them out to hit a few houses, and I just let her run up with the other kids. Well, before I know it she's walking right into the house past the lady with the candy and headed down the hall!!! I ran up after her and the lady was like," oh, sweetie you can't just come into a strangers house." I was embarrassed, but oh well. Nice big dog sitting in the living room too, needless to say I walked her to the door each time after that. I think the kids had a lot of fun this year. 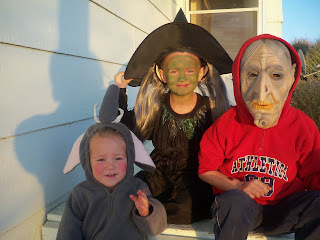 Chili, candy, face painting, trick or treating, costumes, my yummy caramel corn...I think it was a good one. Boy they are getting big fast. 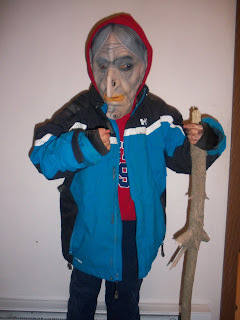 Conner's costume is Hilarious! They all look great. yeahhh...they all look so cute! Happy Halloween!